Sackville Town Council is being asked to approve three bilingual signs urging people to dial the emergency number 911 if they spot impaired drivers and a fourth calling on them to report impaired boaters. If Council agrees, the driving signs would be installed near Trans-Canada Highway Exits 504 and 506 as well as on Highway 106 leading into town. The impaired boating sign would be erected at the boat launch beside Silver Lake. 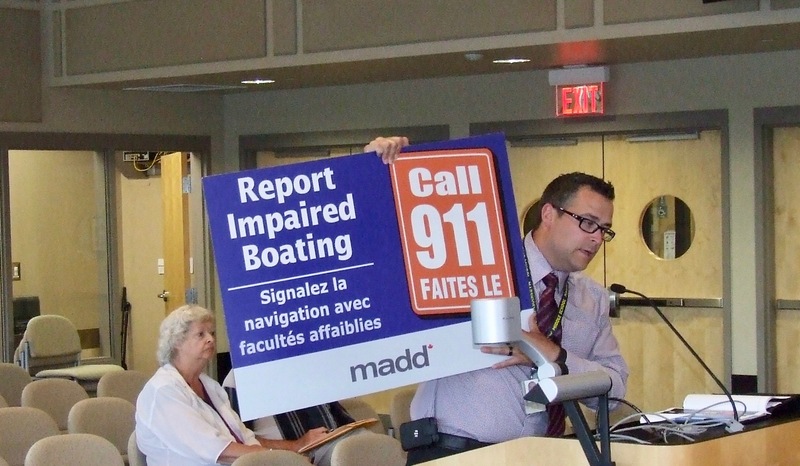 At last night’s council meeting, RCMP officer Jean-Francois LeBlanc said the signs were created by the national organization Mothers Against Drunk Driving (MADD Canada). 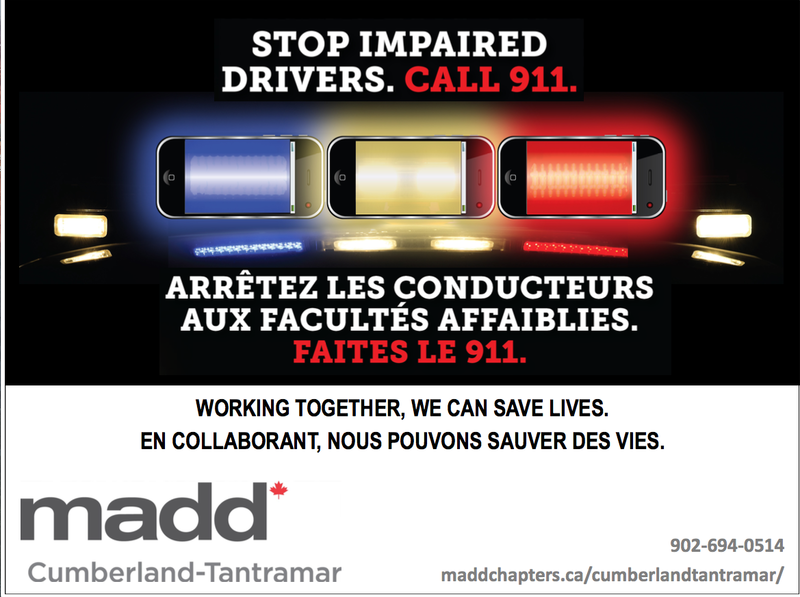 He added that the RCMP logo would be added to the signs to show police support for the anti-impairment campaign sponsored by MADD Canada’s local Cumberland-Tantramar chapter. Councillor Bill Evans said he would be happy to support installing the signs on town-controlled property when the matter comes up for a vote at the next council meeting on August 14th. He wondered, however, whether the town would be responsible for maintaining or replacing any damaged or stolen MADD signs. “We’re happy to help support this if they put the signs up, but it would be a separate commitment to say that we would pay to replace them or to maintain them is it not?” Evans asked. Const. LeBlanc replied that once the signs are installed on town property, the town would be responsible for them, but he acknowledged that councillors might choose not to pay for any repairs or replacements. A study commissioned by MADD Canada estimates that 83 people died in New Brunswick during 2012 as a result of crashes involving alcohol and drugs. However, the authors emphasize that it’s difficult to calculate exact numbers partly because there are so many gaps in the statistical data. In 2013, MADD Canada published an overview of impairment-related crash deaths. It estimated that more than 42 per cent of Canadian crash deaths in 2010 were alcohol related for a total of 1,082 fatalities. “In MADD Canada’s opinion, the 1,082 figure is a conservative estimate, due to the underreporting that results from the inability to conduct alcohol tests on surviving impaired drivers and from the need to rely on police reports,” the study points out. It also adds that the figure does not include deaths resulting from drug impairment. This entry was posted in Town of Sackville and tagged Bill Evans, impaired driving and boating, MADD Canada, Mothers Against Drunk Driving, RCMP Community Program Officer Jean-Francois LeBlanc. Bookmark the permalink. Bravo MADD Canada and RCMP! I have trouble understanding why the question of replacing these signs is even an issue at this point. You have money to waste on other things, what are you woried about. It may save a life.